You may not realize that every consumer engages with cross-selling and upselling on a regular basis. Say you are buying a new TV. The retailer would cross-sell the TV with an add-on, such as a cable box or surround sound audio system. Sometimes it’s necessary to purchase the complimentary items in order to utilize the TV set, other times the add-ons just heighten the TV experience. A retailer may upsell the TV with a package that includes premium HD channels—at an additional rate—beyond the standard channel offering. Both marketing strategies match customers with recommended products that enhance their experience in multiple ways. From the consumer side, they gain access to additional features and deals that they may not have been aware of. From the brand’s perspective, they increase sales opportunities through educating about business offerings. Although the two terms—cross-selling and upselling—are often used interchangeably, there are subtle differences that are essential to recognize so your business can implement them effectively. Let’s start by breaking down each strategy. Cross-selling is a technique that suggests supplementary products to compliment a customer’s initial purchase. A classic example of cross-selling is the phrase “want some fries with that shake?” The sales representative intends to heighten the consumer’s experience—fulfill their needs—by offering an add-on product that compliments the initial product. Rather than guessing the products that may be of interest to consumers, Personalics digs deeper. Using behavioral data, we detect specific products that are complementary and are likely to end up being purchased together. Alternatively, upselling is less concerned with offering an additional product, and more concerned with generating larger commissions. Instead, you are marketing a premium version of the original product the consumer wants to purchase. For example, many apps will offer free downloads and use of standard features; however, if they want access to higher-end features, they must pay a premium. The strategy here is to give users a taste of the experience, and once they invest attention in the product and understand its perks, they will be more incentivized to upgrade. Personalics uses upselling techniques by curating the recommended higher-priced products to suit consumers’ authentic/actual preferences. Psychology shows that no matter what your actual opinion is, people tend to pick the middle option when given a scale. We fear standing out by choosing an option on the lowest or highest end, so we conform to the middle because it’s safe. How can we incorporate this into upselling strategies? We simply make the middle option what we most want people to buy. This way, customers feel like they are choosing the most reasonable offer. Practically, the offer must be realistic for the consumer while still inviting increased sale opportunity for the brand. In order to effectively market to an audience, you must understand what the customer values and responds to. Customers are more likely to make purchases if the items suggested to them are relevant to them, which will ensure more loyalty and trust in the brand. Personalics algorithms tap into this behavioral data to create an efficient and productive buying experience. 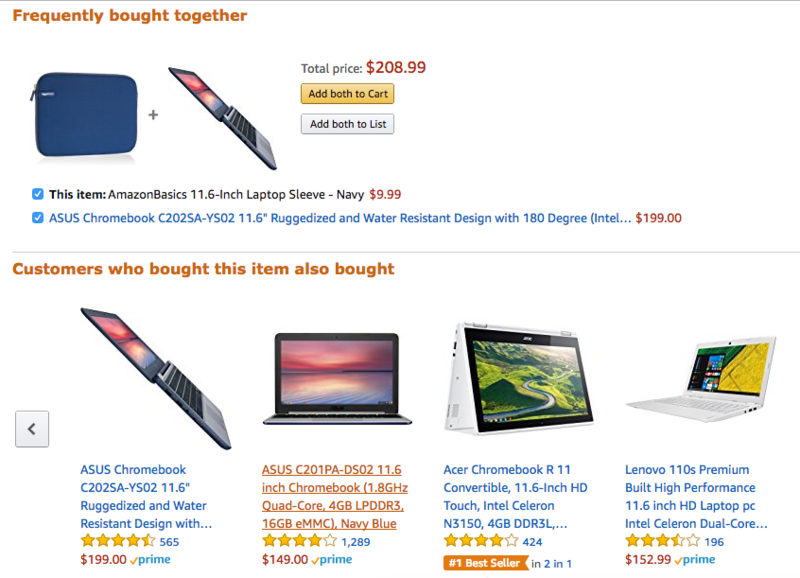 Amazon successfully implements a personalized model of cross-selling in their sections such as “customers who bought this item also bought…” or items “frequently bought together.” Within a large eCommerce retail site, customers feel like they are engaging in a 1:1 experience that is personalized for them. This enables their trust in the brand by satisfying particular needs and willingness to buy premium items that are recommended to them. Increased AOV (average order value) begins a domino effect of more revenue. 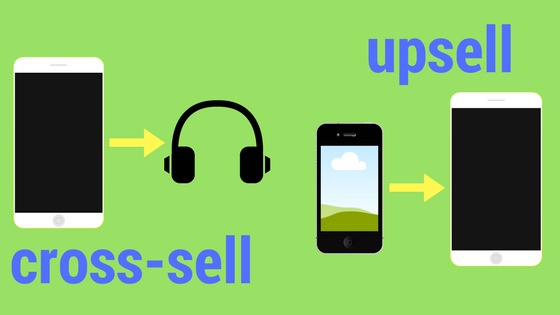 Cross-selling and upselling are essential because they create immediate benefits for both the business and customer. Some great opportunities to include cross-selling and upselling techniques are at check out, in receipt, and through email review. Before you check out on an eCommerce retail site, you may be notified about a deal in purchasing two supplementary items or a discount for buying the premium product. Suggesting more options before completing a purchase always requires A/B testing. Sometimes creating more options during checkout sways the user away from completing the purchase. Or maybe in a personalized email receipt for a new laptop, the brand may recommend extra laptop features, such as a keyboard and a mouse, or upgraded insurance services. Another opportunity exists in a follow up email—usually a few days after purchase—where the brand inquires about the customer’s experience and prompts them to complete a review. 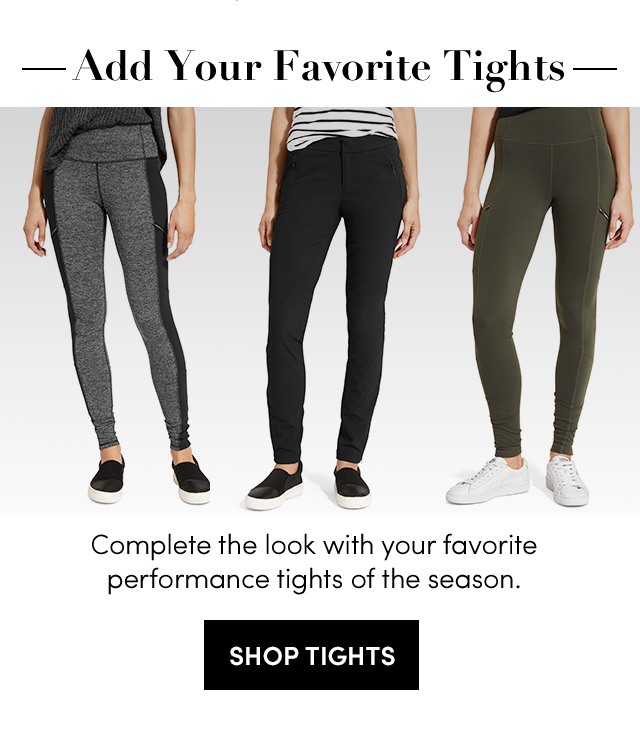 The email review may: feature an image of the purchased product, ask the customers how they like the product and if they have feedback, as well as offer additional products of interest. Respect your customer’s budget and consider the price of original item. According to research by Forbes, a business shouldn’t upsell or cross-sell items more than 25% of original order. You aren’t manipulating the audience, but rather an advocate for them. Keep recommendations filtered and limited. Prefer quality and timeliness over quantity. More options won’t increase sale opportunity. You want to appeal to the audience, not pester them and turn them away. Follow these tips and your business will be one step ahead of competitors because of increased revenue from proven cross-selling and upselling tactics. We value your privacy !